I've been very slow to put up pictures and wall decorations. Every wall does not need something on it. I don't think that I'm minimalist by any means, but clutter appeals less and less. I've seen some wonderful plate walls on blogs. Some are full of pattern and colour, others are just white in various shapes. I went for something in between. A few pops of colour, but lots of white. Most plates are hung with the designated plate hangers seen in hardware stores. I opted out of that look, not wanting the visible wires. Sarah Richardson, Canada's HGTV star, showed how to do a plate wall a different way. I know I've seen a video of her technique, but cannot find it. So, I'm offering you my riff on her method. picture hangers (I found mine at the Dollar Store) The screw is not needed. Set out the plates and decide where you will place the hanger. It doesn't really matter unless the plate has a definite up and down. I placed the hangers so the triangular loop rested on the rim of the plate. Mix equal amounts of the adhesive and resin, as indicated on the directions. Do this in a well-ventilated place because it smells a little. With the stick, apply epoxy to the plate back and then gently place the hanger over top. 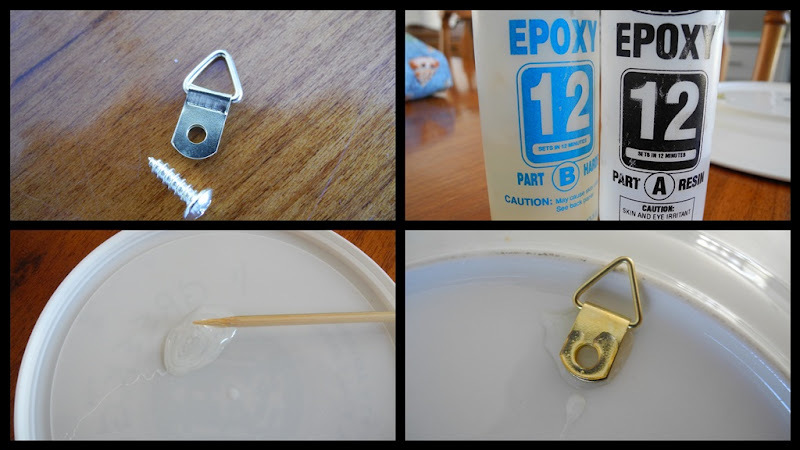 Be careful to not get the moveable triangular loop caught in the epoxy or it will be frozen in place. Which still allows for hanging, provided the hook is positioned properly. I know this from experience. Let the plates dry, undisturbed for at least 24 hours. You don't want your plate to fall off the wall before the epoxy dries. Once the plates are dry, trace each shape onto paper - plain or newsprint. Then start playing with the arrangement you want. I chose an arrangement that started high on one side and angled downwards. You might want a more geometric arrangement. It's your plate wall, do what you want with it. 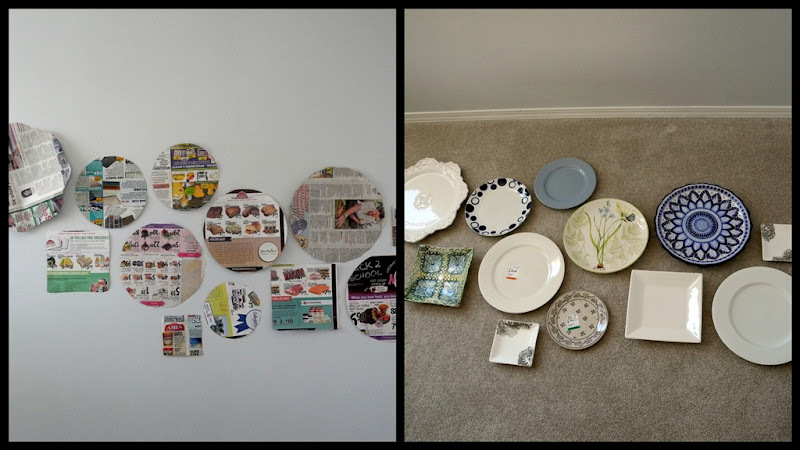 I laid out my plates on the floor in front of the wall I planned to hang them on. Once you are satisfied with the arrangement, tape the paper shapes onto the wall itself. Do any last minute fiddling with spacing now. Then, measure where the hanger falls on each plate, transfer that to the paper shapes and hammer a nail into the wall at that spot, right through the paper. Pull the paper off the wall, et voila! you have your nails perfectly spaced. In the interest of being totally truthful, I did have to move a nail once I got the plates on the wall because I hadn't allowed enough space. Here's my finished wall seen from the middle of the living room. I like looking at it while I'm seated on the couch. It makes me smile. Some of the plates were gifts, some I've had for awhile, and a few I bought just for this wall. I'm curious - do you have a plate wall? Or would you ever want one? People either seem to love them or hate them. Very nice! I'm a plate lover and this really calls out to me! Your arrangement is so smart looking, Lorrie. I have two folk art style plates I've enjoyed for years. No, I take that back, I have my mother's pork chop plate in a plex box and I used it for a sample when I had my custom frame shop. Thanks for sharing. It was new to me all over again! And funny...now I am wondering where I could put a plate wall. Thanks for sending the link! Lorrie - I must tell you that this is the most appealing plate wall i've seen. i love how it looks in your home! Thanks for the tutorial! Very nice, Lorrie. I have a number of plates still packed away that I really would like to display some how. You have sparked so ideas . . . thank you. What a smart idea !I'm going to try . Lovely ! Lovely arrangement and lovely plates. I have 3 Turkish plates on a shelf in my downstairs toilet along with my collection of blue bottles and one or tow special plates on my shelves in the kitchen along with other items of china which I value. It looks fantastic! I love it! And you have done a good "tutorial." Will pin this, OK? so I have it to refer to. That's so cool, and looks awesome! Very pretty! Thanks for doing a tutorial. No plate wall here...as yet:) I'm thinking. I like that! I have a china cabinet full of old tea cups (a lit too old to use) and I was thinking to myself that if I were to glue the cup to the saucer I could also make a tea cup wall! Great inspiration!! I do love this! I've seen the way they are hanging plates these days... it's sooooo awesome. And thanks for the tutorial. I gave away almost all of my plate hangers when we moved because I didn't want to use them again. I'm like you... I don't want that wire showing. I had some plate walls before... but not planning on that in this house.... but ya never know! Yours is beautiful! That is a great way to figure out how to hang a cluster of plates or frames! They look lovely Lorrie and you've hung them with an artist's eye, I would never have thought of placing them on a slant!! I've always adored plates, maybe because my mother had them everywhere. I've only put one lot up in our townhouse - they are on the wall in the guest bedroom. They are pretty tea plates my mother passed on to me! I think I'll re-hang the kitchen ones now - thank you dear Lorrie for your inspiration! I had not seen a plate wall before, but I was starting to think that plates are what I need to put on a snall stretch of wall that nothing else seems to suit. I love your use of them! Your plate wall is gorgeous! I love how it has movement and just sort of flows across the wall. I just added a small plate collage to my dining room, too. I found your link at Jennifer Rizzo. Have a great evening! Super decorating idea that can give a lot of visual interest for very little money. I hope you pinned this post! I'm a plate love and I'm always hanging them up on walls. Great tip!